Installation views of flow at the Contemporary Arts Museum Houston, 2016. Note: We omitted the cangjie in the installation title. Downstairs at the Contemporary Arts Museum Houston, the Zilkha Gallery is a cold space. When it’s empty, the bare white walls and concrete floor can make it feel like an icy cavern buried deep in the Tundra. It’s a suitable place for flow, the latest in a series of site-specific installations by Jae Ko called Force of Nature, on view through September 18, 2016. Force of Nature has taken many different forms. In each iteration, Ko’s technique and execution are similar, but because she is reacting to her experiences with nature as well as the space that each installation occupies, each iteration is unique. 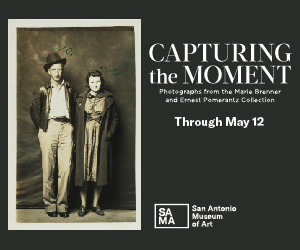 She brings the natural world to the interior of institutions, drawing visitors into different worlds. 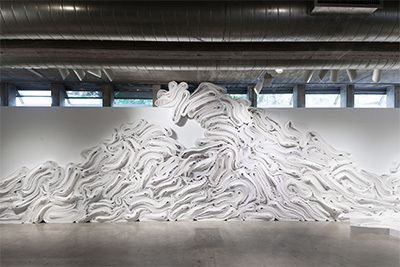 At CAMH, the artist has created a room-sized relief sculpture. The installation turns the walls of the gallery space into a landscape. Enveloping the space in frost, glaciers float across the walls, melting out onto the ground and flowing into the space. 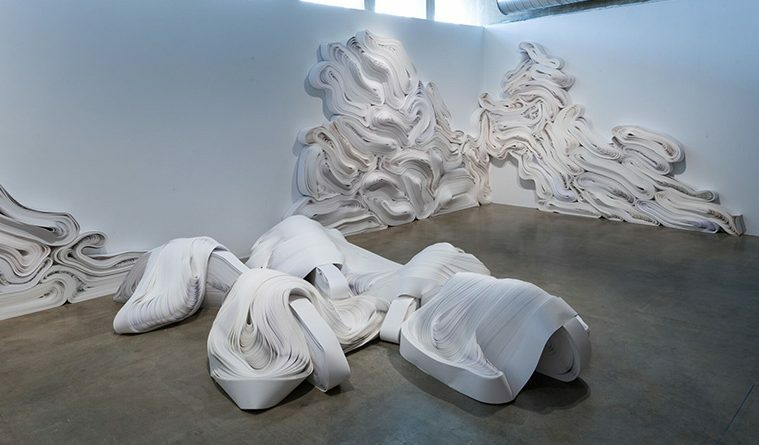 Ko’s glaciers, though, are stacks of rolled paper that vary in shades of white, from a pure, stark white to warmer tones. Perhaps this warmth is why they seem to melt out towards visitors’ feet, only to freeze again, static in their shape. Ko has arranged these rolls, stretched them out, stacked and layered them so that the paper juts outward and pushes inward. 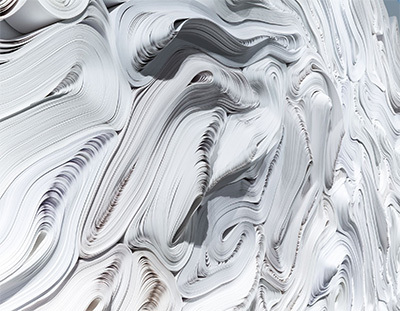 The paper relief undulates, creating the illusion of a shimmering glacier as one walks by. The artist has a strong bond with the material, which she’s worked with for most of the career; she speaks to it, both literally and through intuition, listening and allowing it to shape itself. 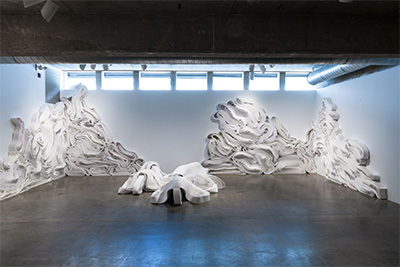 In the past, Ko manipulated, dyed, and shaped paper, always tending toward rolls of the material, the sculptural and hanging work showing her perspective. Now, nature rules her creative process. She shows a deep appreciation of the natural world and an understanding of the impact we have on the environment. Ko’s material of choice is recycled paper, a choice that seems to be rooted in individual thoughts on environmental responsibility more than a politicized public call-to-action. The idea is naturally married into the installation, and the connection is seemingly unavoidable, but it’s merely one aspect of her practice. She combines the aesthetically-spectacular with subtle nods to climate change and environmental impact while allowing the audience to interpret the installation. The artist has transformed Zilkha Gallery, opening up a portal that brings the Tundra into Houston, exposing its citizenry to a landscape they may never otherwise encounter. flow is indeed a force of nature, with a multitude of entry points. The work employs many traits of water—drifting at times, hardening at others—transitioning between physical states of being but never altering its core substance. For a period of time, these frozen ice-like mountains, with their flowing paper, will indeed drift like glaciers, and take their leave of Houston, returning the Zilkha Gallery to its stark architecture , the concrete somehow colder.